The all-new 2015 Hyundai Genesis has been turning heads and raking in the awards in recent weeks, including Car of Texas and Top Family Choice. 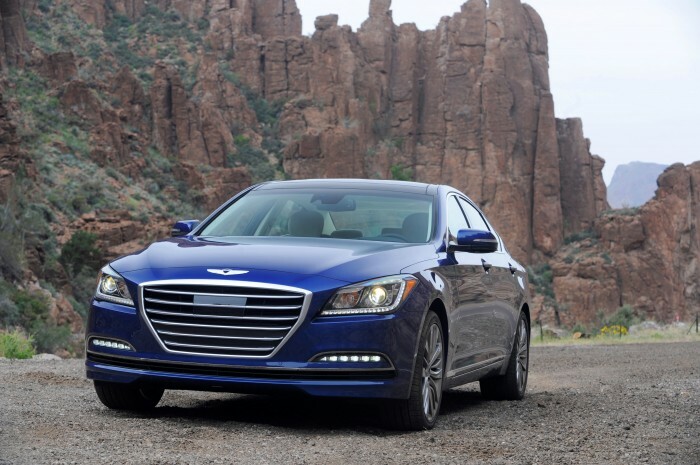 The latest distinction for the 2015 Genesis comes from the Insurance Institute for Highway Safety (IIHS), which awarded the Genesis the institute’s highest distinction: Top Safety Pick+. The Genesis is the first and only rear-wheel drive vehicle in its class to receive such an honor. It is also the first rear-wheel drive luxury sedan to have received a Good rating (the highest available) in the small overlap crash test. To earn this most recent award, the Genesis had to undergo a moderate overlap front crash simulation, a small overlap front crash simulation, a side impact simulation, and a rollover test. In addition, the IIHS evaluated the Genesis’ seat and head restraints to see how well they protected against neck injuries in the event of rear impact collisions. Finally, IIHS examined the Genesis’ front crash prevention system. Safety features for the 2015 Genesis include Sensory Surround Safety™ technology, Intelligent Drive Mode, a Blind-Spot Detection system, Lane Change Assist, and Rear Cross-Traffic Alert.